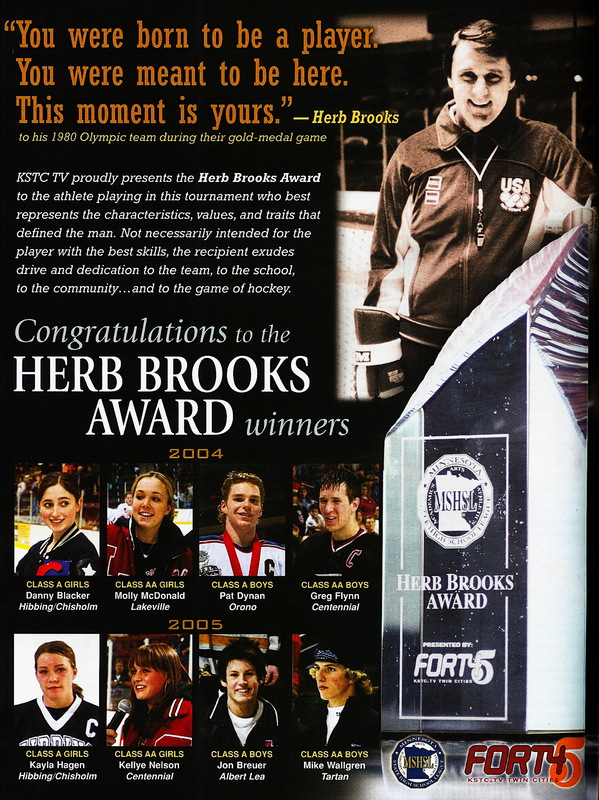 The Herb Brooks award is given annually since 2004 to the most qualified hockey player in the state tournament who strongly represents the values, characteristics, and traits that defined Herb Brooks. This prestigious sponsored award will commemorate the unending influence Herb Brooks had on the sport of hockey in Minnesota and throughout the world. The selection committee comprises current and former high school hockey coaches and other hockey community members with connections to Herb. Herb’s son Dan and his daughter, Kelly Paradise, chair a committee that reviews nominations, observes nominees in state tournament games, and selects the winners. Committee members may interview head coaches to discuss the nominee. Winners are selected during the third period of the third-place game for Class AA and Class A tournament(s). The winner’s coach is notified before the championship game, and the award presentation takes place at the conclusion of each championship game, for each class and each tournament (Boys & Girls).